Herbal Essences Tousle Me Softly Tousling Spray Gel is a messy-style master on a mission to blast frizz and fight for more flexible hold. Use wet or dry, either way, its violet splash fragrance and lightweight, targeted hair spray gel will keep your hands away from stickiness. 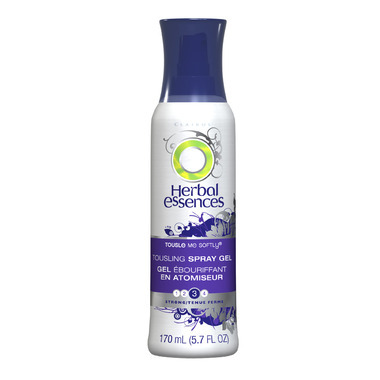 Herbal Essences Tousle Me Softly Tousling Spray Gel lays the foundation for a tousled hair look and soft, touchable locks. To really get a hold on this style, finish with Herbal Essences Tousle Me Softly hairspray or finishing cream. Best leave in product for long curly hair - keeps it from going frizzy during blow dry. Because it's spray in, you get the coverage where you need it. One of my favorite hair care products. Nice product to give your hair body with out feeling stiff. I love it. Very affordable. I love this! I need something to keep my hair from going frizzy in ponytails, and this stuff does the trick, without hardening my hair and making me look like I'm wearing a helmet. love this product. makes my hair more manageable. also the fact that it's a spray-gel doesn't make my hads sticky like cream-gel or mousse. I've been dreading the day when this would be discontinued. This brings out the curl in my wavy-straight hair. First, I use a bit of Live Clean's argan oil on my wet hair, then (while my hair's still wet) I flip my head over and spray some of this all over. I let it air-dry, and the result is awesome! The smell is pretty too, it's a light floral scent of violets. I really wanted to love this, but unfortunately, I did not. It made my hair mega frizzy, along with super dry and crispy. It does smell good though. I'll have to keep searching for a nice curl defining spray, because this definitely is not it.